If you live in or around Canandaigua, Pittsford, or Geneva, NY, sign up for the Fellenz Family Farm CSA next year. (In the meantime, stop by their roadside stand right now.) The quality of produce we get is phenomenal — just last night, I toted home a large bag filled with just-picked spinach, green beans, mizzuna, swiss chard, early season sun gold tomatoes, summer squash and cucumbers. But if I hadn’t already taken home so many, I would have also picked up some of Andy Fellenz’s beautifully dark and flavorful blackberries too. This is a recipe I developed to accompany an article I wrote on the Cayuga Lake Creamery for the current issue of Edible Finger Lakes. Due to space constraints, the recipe was cut (SIGH) but the article on the Creamery remains (the article is now online, click here for a pdf.). The Creamery is another must-visit if you’re in the Finger Lakes. The owners, Jeff Kostick and Judy Gonroff, are the nicest people you’ll ever meet (as are their employees) and their ice cream is innovative, of superb quality and, most importantly, delicious. Close your eyes and imagine your ideal ice cream flavor. Is it a bright and flavorful raspberry, dotted with toothsome bits of icy fruit? Does it taste of strongly-brewed iced coffee, mellowed with sugar and fresh cream? Or do you crave a darkly decadent chocolate, lush with cocoa and studded with of homemade brownies and dark chocolate chunks? Fulfill your ice cream dreams with these flavors–or one of many, many others–at Interlaken’s Cayuga Lake Creamery. This sorbet will tide you over until you can make it to the Creamery yourself. Combine sugar and water in small saucepan. Bring to boil over high heat, stirring until sugar dissolves. Boil one minute, then remove from heat and allow syrup to cool to room temperature. Puree blackberries with lemon juice in a food processor. Remove seeds by forcing the puree through a fine strainer into a bowl. Add the syrup and crème de cassis to the strained puree and chill until very cold. Process berry mixture in ice cream maker according to manufacturer’s instructions. Transfer sorbet to an air-tight container, cover and freeze until firm, about 6 hours. *frozen blackberries may be substituted. Measure while frozen, allow to thaw, and proceed as outlined above. 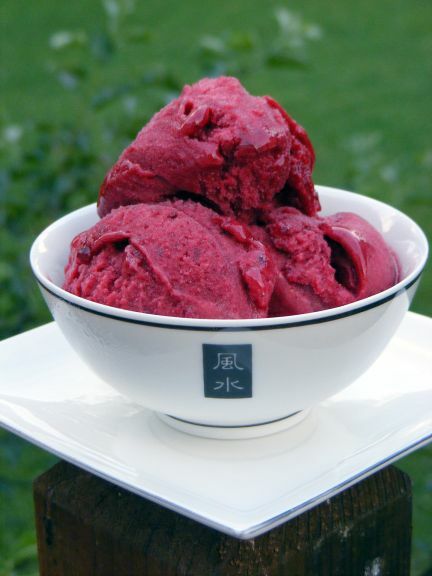 **omitting the liqueur will result in a firmer sorbet.